Gardens - Grow. Eat. Share. Most classes will be held at the main teaching garden. It's a large fenced in area that includes 22 8x3 raised garden beds and a five tree orchard with apples, plums and cherries. The Grow. Eat. Share. Garden is located at The Mustard Seed landscaping and garden center in Chaska, MN. To find our garden, walk past or through the main garden center. Walk down the center isle, and you'll find us directly behind the playground and petting zoo. 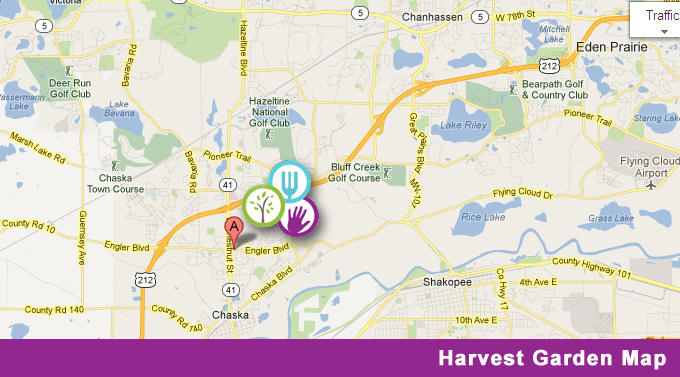 From downtown Chaska - Take Hwy 41 north to a left turn or west on Engler Blvd to the new Hwy 212 west. Go 4 miles, and the The Mustard Seed will be on your left. From the intersection of 212 & Hwy 41 - Take 212 west for 5.3 miles. The Mustard Seed is on the left. From Minneapolis - 394W, exit to 100S, exit to 62W, merge onto 212W, road will turn into 2-lane highway, The Mustard Seed will be on your left. Every summer two of the classes will be held at the main harvesting garden. It's a large row garden situated on a grassy field with a beautiful weeping willow tree for shade. It gives us room for sunflower rooms, pumpkins, watermelon and to play "Zucchini, Zucchini, Kholrabi!" The Grow. Eat. Share. Garden is located at Shepard of the Hill Church in Chaska. To find the garden, park in the Shepard of the Hill parking lot. You'll know you're in the right location if you see an oversized rocking chair on the corner. Then walk down the hill behind the church. Pass the playground, prayer garden and fire pit. Walk toward the weeping willow tree and look for a huge garden. From Downtown Chaska - Take Hwy 41 north to a right turn on Engler Blvd and the church will be immediately on your right (southeast corner of Engler and MN-41/Chestnut). From the intersection of 212 & Hwy 41 - take MN-41/Chestnut to a left turn on Engler Blvd, and the church will be immediately on your right (southeast corner of Engler and MN-41/Chestnut). From Minneapolis - 394W, exit to 100S, exit to 62W, merge onto 212W, exit on MN-41/Chestnut St., take left on MN-41/Chestnut, turn left on Engler Blvd, and the church will be immediately on your right (southeast corner of Engler and MN-41/Chestnut). Still have questions? Please contact Laura Greene.